Helen Keller had shown a new light to millions of blind people. She filled the millions of deaf and dumb with inner music of life. Born in Boston of USA in 1880 she lost her eye sight when she was a baby. She lost her power of hearing too. Consequently she could not speak. Her mother loved her very much. As a child Helen Keller was admitted to the school for blind. Her teacher ‘Sullevan’ had been blind herself but had regained her eye sight. She developed a special interest in Helen Keller. She taught her communication with fingers and palm. Helen first wrote ‘Doll’ on her palm with fingers. She loved her ‘Doll’ very much and always kept it with her. She wrote many new words and started spending her time learning the Brail language. One day some words also came through her mouth which gave the greatest happiness to her. She learnt English, German and French. She passed matriculation from Cambridge School of USA. 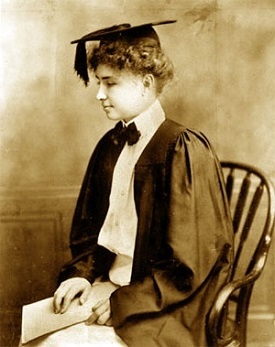 She was also admitted in college and passed BA with first class in 1904. Her hobbies were horse riding, swimming, rowing, playing chess and cards. She authored nine books. Her autobiography ‘My Story of Life’ was translated in fifty languages of the World. Her book “My inner World” is treasure to World literature. At a young age she desired to marry but changed her mind in favor of social service. Helen Keller established the “Blind Society,” and started publishing books for blind in Brail language. She traveled around the World to places like Europe, Canada, Australia, Egypt, India, Japan, South Africa etc. She encouraged blind and deaf people all over the World. She was a lover of nature. She felt the beauty of flowers, moonlight, waves etc. through her inner eye and was delighted. She has written “The best and beautiful things in the World can not be seen or even touched ; They must be felt with heart”. She used to construct her own images of the World through her imagination and inner vision. She had also said “Never bend your head. Hold it high. Look straight to the World”. Helen Keller was an embodiment of courage, conviction and compassion.